Patient with osteoporosis may complain of fracture of the femur, spine, forearm and thoracolumbar spine. Patient may also present with back pain and loss of the height with compression of the vertebral ( kyphosis). 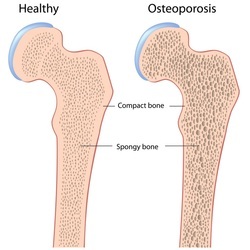 Osteoporosis occur due to decreased in the mass of the bone. This occur due to defective in bone synthesis or an increase in the bone reabsorption. Osteoporosis may present with thin cortex, fewer and thinner trabeculae and widened Haversian systems. Osteoporosis is treated with calcium supplement, vitamin D supplement, pneumatic braces, bisphosphonates and replacement of the estrogen. Osteoporosis commonly affect elderly. Patient with Cushing syndrome, hyperthyroidism and menopause ( due to deficiency of the estrogen) are also susceptible in developing osteoporosis. Other condition such as anorexia and genetic bone disease may also lead to osteoporosis. The laboratory investigation such as DEXA scan or bone density scan is useful in detecting osteoporosis. There will be a reduction in the bone mass. Radiography may reveal diffuse radiolucency on the area that suffer from osteoporosis.